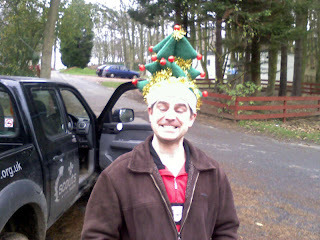 Above : Annual Fordell silly grin competition winner. Several days of torrential rain led to the difficult decision to cancel one the of the main events of the year, the 'Final Countdown'. This was part of the '12 camps of 2007' and had been intended to be an action-packed weekend camp for Explorer scouts from across the country; however due to the weather it was decided that the camping areas were far too wet to host the event and it was cancelled midweek. A few local explorer scouts did come in for the weekend, however, and ran their own activities from the relative warmth of the Richmond Chalet. 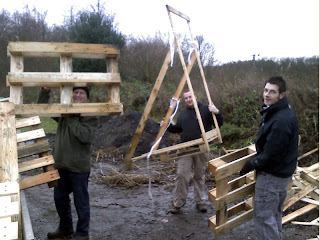 The weather was fairly dry on saturday, although the fields were waterlogged, and the staff spent the day carrying out a number of tasks on site (moving wood, trimming trees). Things got much busier in the evening when the heavy rain returned and an SOS was received from the Explorers in the Richmond Chalet that they were being flooded out. 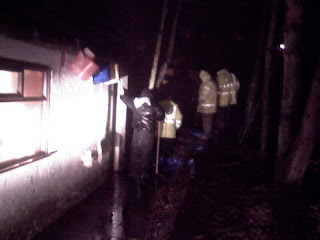 A crack response-unit was despached from the staffhut armed with spades, torches (well one) and sandbags (well bags of rocksalt), and an hour later had managed to clear up the flood and divert the water elsewhere. In restrospect, it was realised that the correct decision had been made to cancel the camp, as it would have been chaotic if there had been hundreds of people camping on the saturday night. Above : Emergency Response Unit in action. Bright light at top RHS is Ali - as the only person with a headtorch, he was assigned the role of Emergency Lamppost. Sunday was altogether more relaxing with no major incidents and the only drainage problem being a significant leak from the staff urn during the day of approximately 10 cups/hour.